Zeus tries to explain that it’s not what it looks like. But how could it not be? What else could it be? How can Ghlaghghee ever learn to trust again? Kodi, meanwhile, stares pensively into the distance. She’s the oldest and wisest of the trio. In her heart, she knew that it could never last. But they’ll always have the stairwell. And tonight. Hm. Somebody leads a rich fantasy life! Dammit John, now I have Bob Seger in my head! Better to have Bob Seger in your head than that insipid Kenny Rogers cover. I used to have a cat that would pepper our dog with tender little cat kisses and the cuddle up next to him. The other cat would go all apoplectic. Someone had to say it. Just glad to be there for ya, Scalzi. Now Zeus will be forced to resign from his Scalzi Household congressional seat. GHLAGHGHEE: Hey, baby, when you coming home? ZEUS: I… um… am out picking up a quart of milk, and I want to make sure I get the right one. GHLAGHGHEE: Well, hurry home, baby. I miss you. 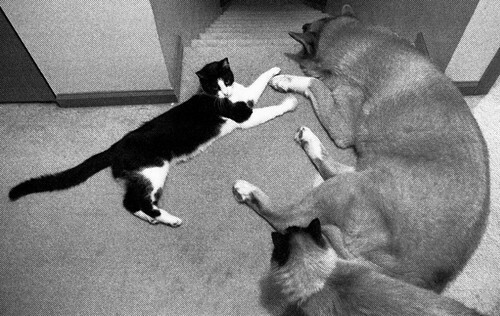 -the artist formerly known as Tracey C.
It is interesting how animals like to lay at the top of a stairwell. Both my dogs will do it when I am upstairs, or sometimes one will be at the top and the other will cover the bottom. Wow – give them all superpowers and it would be like an episode of “Heroes”. How do you get these types of pictures from your pets? Do you just follow them around with a camera and get whatever you can or do you see them in a situation and then go get the camera? O On Dangerous Ground Scalzi, are you begging to have your recently granted Seal of Approval Award stripped and a Seal of Disapproval Award awarded? There are so many things wrong with this poor picture we hardly know where to begin. 1. Magnificent She is not centered nor filling the frame. 2. Anteater-Thing is not permitted in any picture posted on this silly blog, or have you once again forgotten? 3. This is 2008 and believe it or not, you have no artistic talent. Therefore, the picture should be in color. 4. Again, your textual update is so full of foolishness there’s nothing to do but delete it and hope it disappears from our memory. You really are hopeless. We feel so sorry for the Trials and Tribulations of Her Most Glorious Shimmering Radiance in having to associate with you. But She will prevail in the end. Alternate caption: Another busy day at the All-Species Nail Salon. A little puss never hurt anyone… mostly.